JOHANNESBURG (miningweekly.com) – Mine-to-metals company Jubilee Platinum on Monday reported that the gross profit margin of its Middelburg operation had improved to 44% in the fourth quarter of 2014, exceeding the targeted gross profit margin of 38%. The operation included a smelter and power generation facilities. 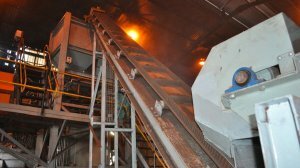 The Aim- and AltX-listed company attributed the improvement to the implementation of a process review and optimisation strategy that had focused on reducing the operation’s power consumption per tonne of metal produced. “This successful strategy has led to a reduction in power used per tonne of metal produced, of about 16%, thereby making more power available for export from the power plant to [power utility Eskom’s national grid],” Jubilee highlighted in a statement on Monday. Meanwhile, the operation increased its net profit to R2.5-million in the quarter under review, compared with R1.3-million in the quarter ended September 30. It also recorded higher revenue of R23.8-million in the period under review, compared with R21.6-million in the third quarter. The Middelburg operation’s total ferroalloy metal production increased to 2 282 t in the fourth quarter, up from 2 031 t in the previous quarter. “Our Middelburg operation [has] maintained its performance, thereby meeting the targeted throughput and gross profit margins. We will continue to strive to further optimise these operations by reducing the variable cost per metal ton produced, while containing the operations’ overhead. “We look forward to concluding a five-year extended power purchase agreement (PPA) with State-owned power utility Eskom, while simultaneously increasing the power supplied to the national grid,” said Jubilee CEO Leon Coetzer. Jubilee had, earlier this year, entered into discussions with Eskom regarding the potential to increase sales from its power plant, as well as to extend its existing short-term PPA. These discussions were expected to be concluded by April. Coetzer noted that increased power sales, together with the further improved smelter operations, were “targeted areas” to further enhance the Middelburg operation’s earnings. Meanwhile, Jubilee pointed out that the Department of Mineral Resources (DMR) had requested its Tjate Platinum subsidiary to support its mining right application with an operational rehabilitation guarantee. The company believes the DMR’s request is expected to be the final step prior to the issuance of a mining right for entering into the platinum-group metals (PGMs) heads of agreement with Hernic for the processing of its PGMs-containing surface chrome tailings. Jubilee added that the Hernic and ASA platinum processing projects had now been placed on accelerated project schedules, with both projects expected to become fully operational during the course of 2016. “Jubilee continues to invest into the two platinum surface processing projects at ASA and Hernic as it accelerates these projects to bring them into production. The platinum surface processing projects will allow Jubilee to produce low-cost platinum concentrates for further processing at the smelters in the near term. “The two projects will target a combined throughput of about 80 000 t/m of platinum-containing surface material. These projects have the potential to significantly transform Jubilee into a low-cost platinum producer from surface operations, underpinned by the Tjate platinum exploration project,” stated Coetzer.